Join us for an exclusive progressive meal. Meet chefs, brewers and restaurant owners as you get a peek behind the curtain into the Olympia culinary scene. 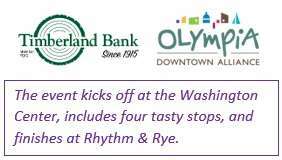 Recently publicized, by Food & Wine and Seattle’s Fox Morning News, as “the next great culinary capital” Olympia is the place to be! Guides will usher you from venue to venue to sip and savor small plates from downtown restaurant’s signature dishes and drinks. Notice: Walking routes range from .9 miles to 1.2 miles total. Please wear comfortable shoes. Use the "contact event organizer" option below to request accommodations, or have dietary considerations.